Performers include: Duane Martin, LisaRaye, Khamani Griffin, Tony Rock, Elise Neal, Terri J. Vaughn, James Vincent, and Laivan Greene. 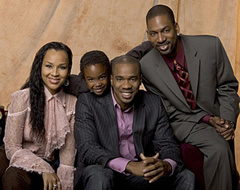 Robert James (Duane Martin) is a California-based TV entertainment reporter with a young son, Bobby Jr. (Khamani Griffin). Recently divorced from self-involved Neesee (LisaRaye McCoy), Robert is madly in love with a kindergarten teacher, his fiancee Tia Jewel (Elise Neal). Being a modern man, he tries to maintain peace between his ex-wife and bride-to-be, often with humorous results. Providing support are Robert’s best friend and producer Dirk Black (Tony Rock) and Tia’s friend, fellow teacher Jonelle Abrahams (Terri J. Vaughn). Neesee asks Robert for some of his sperm but he doesn’t agree to give it to her. She is invited to her mother’s wedding in Tulsa and the two travel there. Neesee and Robert are stuck in a hotel and are starving so they decide to crash the wedding downstairs. While there, they’re mistaken for singers Beyonce and Jay-Z and end up singing a song for the crowd and having a great time together. As they return to their hotel room, the two kiss. First aired: May 14, 2007. It should be a final show having the 2 of them getting married again.